Molecular biology techniques are at the forefront of scientific research and are widely used to develop analytical methods to evaluate advanced-therapy medicinal products. The main techniques implemented at GenoSafe include Polymerase Chain Reaction (PCR), Real-time quantitative Polymerase Chain Reaction (qPCR) to detect and quantify DNA; and real-time quantitative Reverse Transcription Polymerase Chain Reaction (RT-qPCR) to quantify gene expression through measurement of mRNA synthesis. – Product characterization: quantification of viral genomes, biological agent detection, as a final read-out measurement for some potency tests, quantification of infectious genomes, copy number analysis…. 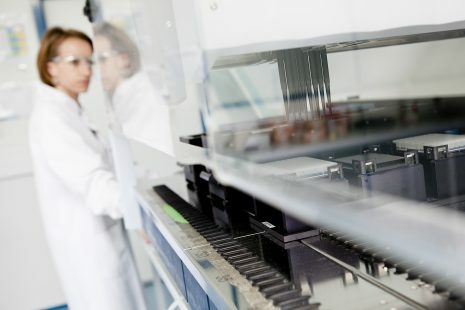 Our dedicated team has a long experience in designing, optimizing, validating (per ICH guidelines), and performing customized assays based on molecular biology techniques. Depending on your specific needs our services can be performed at research grade or under GLP and GCLP regulations. We carry out DNA and RNA extraction from cells, viruses, tissues, organs and fluids following optimized protocols.